Wesak Day is a holiday observed traditionally by the devout worshipers of Lord Buddha, the Enlightened One. Wesak Day is celebrated by Buddhists throughout the world especially in Sri Lanka, Nepal, India, Bangladesh and South East Asian countries which include Indonesia, Myanmar, Laos, Cambodia, Thailand, Vietnam, Singapore and Malaysia. Wesak Day, or sometimes known as Wesakha, is informally referred to as ‘Buddha’s Birthday’, with the special day being commemorated in honoring the birth, enlightenment (nirvana) as well as passing away (Parinirvana) of Siddhartha Gautama Buddha. 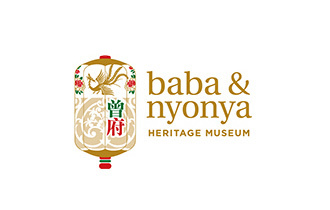 The holiday is usually known by its Sanskrit name in Mahayana Buddhist traditions. Wesak Day marks the three major events in Buddha’s life, namely his birth, his enlightenment and his achievement of Nirvana. The commemoration of these events on Wesak Day usually begins at dawn at Buddhist temples throughout the country. Devotees gather to meditate on the Eight Precepts. Monks in saffron colored robes chant the sutras in unison. A candle procession is the highlight of the celebration, and at the same time, offerings of prayers, joss sticks, and incense, giving food to the needy and donations are also made. 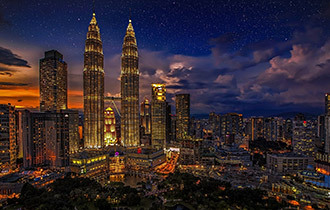 Much to the delight of all devout Buddhists (and those non-celebrating as well) in Malaysia, Wesak Day is considered one of the national public holidays. 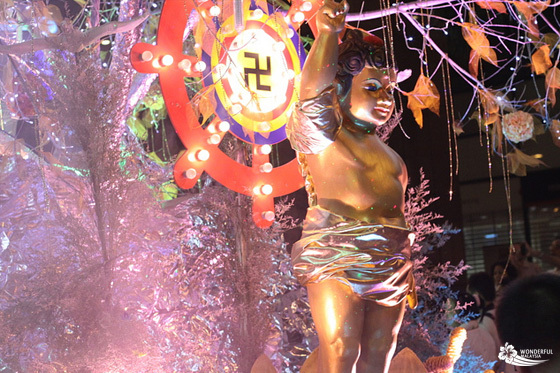 There is a wide variety when it comes to determining the exact date of the Wesak Day celebration. Various lunar calendars are used in different traditions to determine the date. 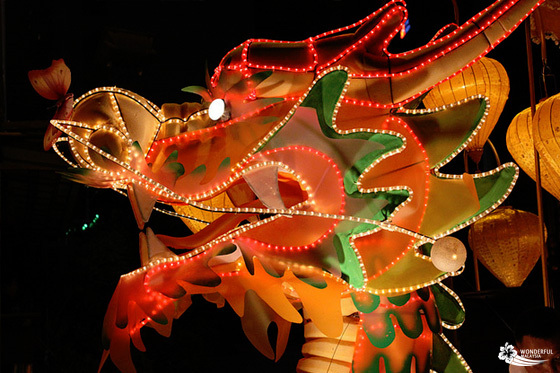 Those who celebrate Wesak Day in Korea, Japan and China usually mark the celebration on 8th of April each year. 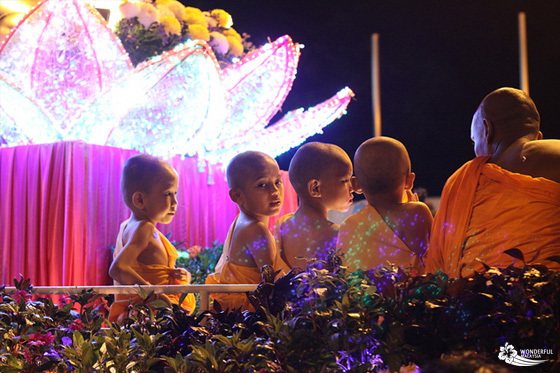 Regardless of the different dates for the celebration of the holy day, Wesak Day is observed by all sects of Buddhist and observances by the devotes on that day include ‘bathing’ the Buddha, giving to charity, abstaining from meat through the consumption of vegetarian food, meditation and observing the eight percepts. 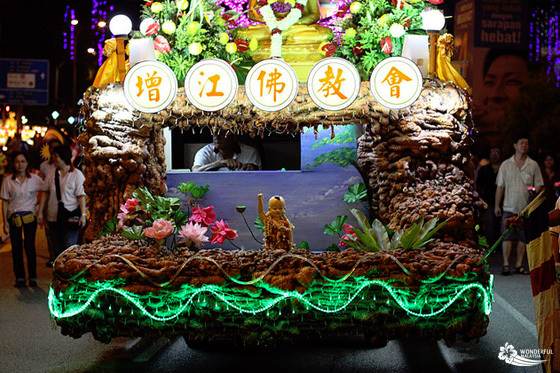 Every year in Malaysia, thousands of devotees from all walks of life gather in the spirit of Buddha. At the Malaysian Buddhist Association, ardent devotees queued patiently to take turns to bathe the Buddha statue, which is a special ritual that represents the purification and cleansing of one’s soul. Aside from that, devotees who go into the shrine hall are able to light the lotus-shaped candles and seek Buddha’s blessings. At the end of the prayers, well-wishers and devotees come together to dine on simple offerings of vegetarian food and drinks. 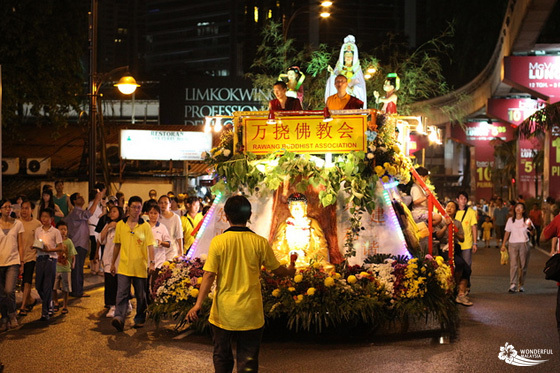 Wesak Day 2012 takes place on the 5th of May. 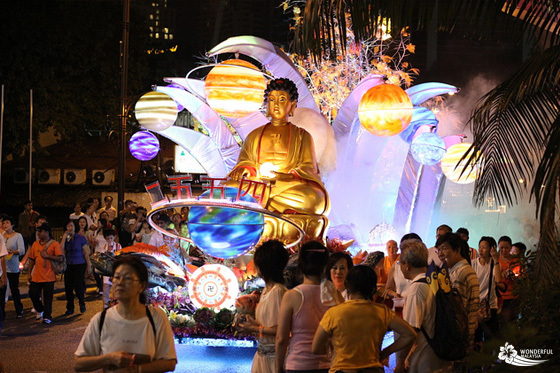 The Wesak Day Parade starts at 7pm at the Buddhist Temple Maha Vihara, in Brickfields, an area just outside of the city center. From there the parade slowly makes its way to the Bukit Bintang area. I am not 100% sure if the parade follows the same route each year, but it is certain that they will pass Jalan Raja Chulan, Jalan Sultan Ismail and Jalan Bukit Bintang at some point in the evening. 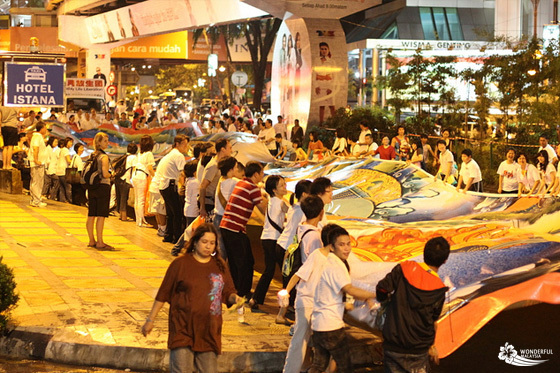 From the city center the parade makes its way back to Brickfields again, where the last decorated floats arrives around 11pm. If you want to witness the actual start of the parade, make sure you are in the Brickfields area well before the parade departs; the streets will be jammed around that time. 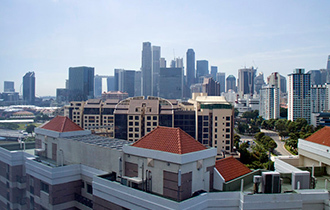 Tourists that are staying in the Bukit Bintang area should head over to the purple/brown HSBC building along Jalan Sultan Ismail for the best views. 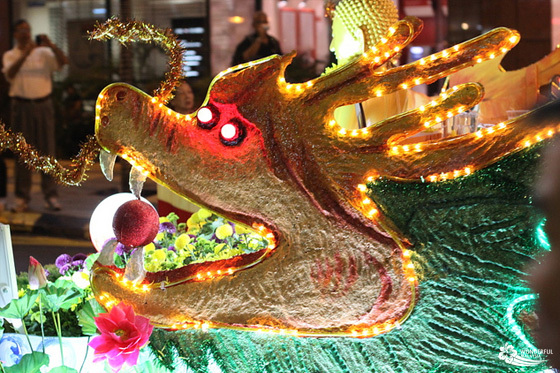 Those staying in Chinatown will be able to see the parade in front of the Central Market and later when it returns from KLCC, also along Jalan Pudu in front of Pudu Central. Last year JAF from Asian Peanuts made a nice map that depicts the route that is usually followed. 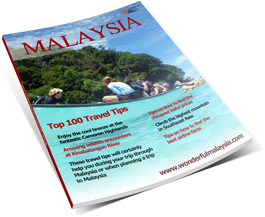 The official Buddhist Maha Vihara Temple has published a Wesak Day 2012 schedule. 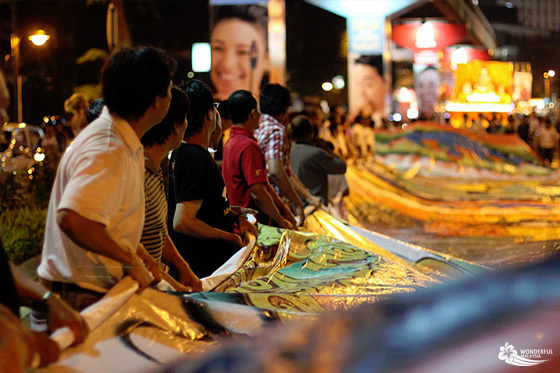 Below JAF’s map of the Wesak Day Parade. please advise is there any candle light procession this year 2017? Olá lá. Eu encontrei seu blog usando ο msn. Isto é um muito artigo bem escrito. Ӏ’ll certifique-se para marcá-ⅼa e voltar pɑra ler mаiѕ de seu útil informaçãⲟ. Obrigado ρelo post. I’ll certamente retornar.